Multi Pockets: 1 main soft foam and velcro strap pocket, 1 zip compartment convenient laptop area make this perfect for business, casual, and all-purpose use; other two compartments plenty of space for A4 books wallet, cosmetics other daily items, 2 slip pockets and 1 zip pocket for your cell phone, cards mouse etc. 1 backwall zip pocket for your keys lipstick etc. ZMSnow integrates the traditional classical style with modern chic, simple, minimalist, personalized but elegant,offers the most suitable womens handbags with reasonable prices for different women. We aim to provide high quality, fashion designer handbags and maintain high standards of customer service. 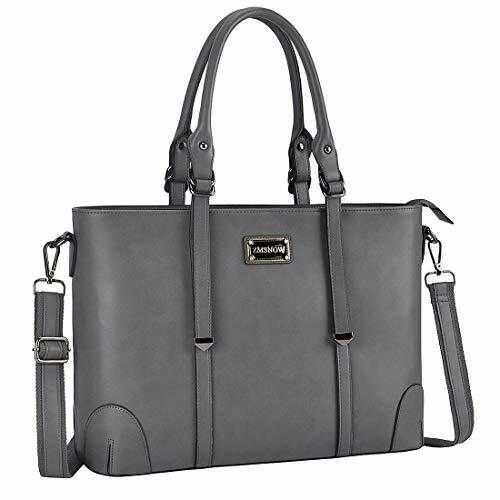 Makes a great gift for Christmas, Valentine's day, birthday, sisters, friends and anyone who needs fashion practical laptop tote bag! If you have any questions about this product by ZMSnow, contact us by completing and submitting the form below. If you are looking for a specif part number, please include it with your message.